Education is a vital part of sustainable development which is why it is Goal 4 of the SDGs. This review of Goal 4 encompasses the importance, recent history and current status. In addition to economic benefits investing in education pays lucrative dividends in a number of ways. Education empowers people to improve conditions for themselves and the communities in which they live. It enables them to meet the challenges they face and it helps them to steward their resources more efficiently. Education has implications for political leadership and while most of this article focuses on poorer countries education is also important for some of the wealthiest nations on Earth. Education can help people to cast off the shackles of tyranny and it can help them to build representative democracies. It is also essential to the well being of existing democracies. As we have recently witnessed uneducated and uninformed electorates are easily deceived by those who preach the destructive politics of fear and division. Obtaining a quality education is the foundation to improving people’s lives and sustainable development. Major progress has been made towards increasing access to education at all levels and increasing enrolment rates in schools, particularly for women and girls. Basic literacy skills have improved tremendously, yet bolder efforts are needed to make even greater strides for achieving universal education goals. For example, the world has achieved equality in primary education between girls and boys, but few countries have achieved that target at all levels of education. To help us to further appreciate the central importance of education here is a summary of the recent history and current status of SDG 4. In 2015 Sustainable Development Goals (SDGs) replaced Millennium Development Goals (MDGs). SDG's emphasis on sustainable economic development expands on MDG efforts to reduce poverty. A total of 193 world leaders engaged in a process that formally accepted the SDGs at the United Nations summit for the adoption of the post-2015 development agenda which took place on September 25 and 27, 2015 in New York. 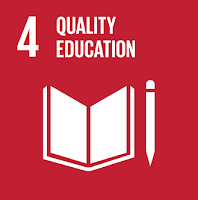 There are 17 SDGs and the 4th sustainable development goal consists of "ensuring inclusive and equitable quality education, and promoting lifelong learning opportunities for all." (United Nations, 2017). In many respects, education is key to addressing other SDG's. Education is also central to the development aspirations of the world's poorest countries. While the MDGs have made progress on this front much more needs to be done to ensure that an equitable quality education is available to everyone. Sustainable Development goal 4 is derived from the Millennium Development goal number 2, which was t achieve universal primary education by 2015, as well as the Dakar Framework. The Dakar Framework for Action on Education for All aimed to eliminate all gender disparity in primary and secondary education by 2005, and at all levels by 2015. In 2000, world leaders set out the MDGs to help eliminate poverty worldwide. MDGs were inaugurated as the "world’s greatest promise" in the pursuit of concrete, measurable improvements in global poverty, hunger, health, education and other key social issues. In June, 2013 the UN secretary-general, Ban Ki-moon, called the goals "the most successful global anti-poverty push in history." In total, there are eight MDGs, 21 specific targets and more than 60 indicators. One of the outstanding accomplishments of the MDGs involve cutting the number of people who live in extreme poverty by half. We have seen progress on seven of eight MDGs including education (we have also seen progress on poverty, hunger, child mortality, HIV, water and sanitation). However we have not seen the progress we would like to see on gender equality, particularly as it relates to schooling for girls and women. In June 2012, countries at the Rio+20 Conference on Sustainable Development put forth the basic outline of SDGs and member states agreed to establish an "inclusive and transparent intergovernmental process open to all stakeholders, with a view to developing global sustainable development goals". They agreed to build upon the MDGs and converge with the post-2015 development agenda that included a process to develop a set of SDGs. A number of work streams were commenced to elaborate on the proposed SDGs. In the Rio+20 outcome document, member states agreed that sustainable development goals (SDGs) must be based on Agenda 21 and the Johannesburg Plan of Implementation and respect all the Rio Principles, while staying consistent with international law and build upon commitments already made. Members will address and incorporate in a balanced way all three dimensions of sustainable development and their interlinkage, and be coherent with and integrated into the United Nations development agenda beyond 2015, not diverting focus or effort from the achievement of the Millennium Development Goals and including active involvement of all relevant stakeholders, as appropriate, in the process. It was agreed that SDGs must be action-oriented, concise and easy to communicate, limited in number, but global in nature and universally applicable to all countries while taking into account different national realities, capacities and levels of development and respecting national policies and priorities. The outcome document also mandated the creation of an inter-governmental Open Working Group, that will submit a report to the 68th session of the General Assembly containing a proposal for sustainable development goals for consideration and appropriate action. SDG Open Working Group had its first session in March 2013, in total there were eight sessions that concluded in February 2014. On the morning of September 25, 2013, the UN General Assembly officially approved the inclusion of SDGs to replace MDGs. This measure passed thanks in part to a new coalition of poorer countries and the U.S., Europe, Japan and other nations. The creation of the SDG involved "substantive discussions" from various working groups and a debate in September 2014 at a session of the General Assembly. The final goals were released in September 2015. A September 2013 special report from a consortium of organizations led by CIGI and the Korea Development Institute (KDI) reviewed a number of options for the post-2015 successors to the MDGs. The report concluded the global community must build on the current MDGs and move beyond meeting basic human needs. In addition to emphasizing the role of adolescent girls, the report supports the creation of inclusive sustainable development goals. To ensure the prioritization of sustainable development at the highest levels of government, members at Rio+20 agreed to change from the CSD, which was formed after the 1992 Earth Summit in Rio de Janeiro, to the High-level Political Forum (HLPF) on sustainable development. The HLPF brings together government leaders every four years as part of the General Assembly to address the challenges of sustainable development. It also meets annually at the ministerial level, as part of the UN Economic and Social Council (ECOSOC). The first HLPF meeting on SDGs took place at the 68th session of the General Assembly. On September 24, 2013, the HLPF on Sustainable Development reiterated the agreements articulated at Rio+20. At the inaugural ceremony for the HLPF, UN Secretary-General Ban Ki-moon said, "Your forum is a key platform for examining today’s challenges in a holistic and integrated manner. This forum can be the catalyst for a strengthened global partnership for sustainable development, providing political leadership grounded in solid science." To advance the work of the HLPF, the UN General Secretary created a Scientific Advisory Board. General Assembly President John William Ashe said, "We have created this HLPF for the express purpose of delivering more effectively on our aspirations and agendas at a time when we realize that the practice of sustainability provides the only real bridge from our past to our present and our future, and from our planet to our peoples and our prosperity." The HLPF is also involved in accountability and ensuring that there is an ongoing focus on action. In 2016, the HLPF reviewed the implementation of sustainable development by all countries and the UN system. "People have a right to expect real results from the new Forum," said Wu Hongbo, UN under-secretary-general for economic and social affairs. "There are real challenges that must be faced. People need jobs, healthcare, and education,” he said. “And they also need food security, clean air, and clean water. They need development that is sustainable, and the Forum has to deliver progress in all of these areas." When the UNESCO launched the United Nations Decade for Education for Sustainable Development in 2005, it was raised that education should also align societies’ values with supporting sustainable development. As a follow-up from the UN Decade for ESD in 2014, UNESCO also released the Global Action Program on Education for Sustainable Development in which “the overall goal is to generate and scale up actions in all levels and areas of education and learning to accelerate progress towards sustainable development. In its actions, GAP focuses on policy support, whole institution approaches, educators, youth, and local communities, as key areas to work on. After Rio+20, the HESI Partnership was created, (Higher Education Sustainability Initiative) with the intention of motivating higher education institutions to teach as well as promote research on sustainable development, greening campuses and supporting local sustainability efforts. As a result, almost 300 universities around the world have voluntarily joined the partnership. (United Nations, 2017). More work needs to be done to ensure inclusive and equitable quality education for all. This is especially true in sub-Saharan Africa and Southern Asia. We have made progress on education but many challenges remain. While education enrollment is up around the world, the quality of this education is directly related to development status. There are 263 million children and youth that are not going to school, this includes 61 million children of primary school age. This problem is especially severe in Sub-Saharan Africa and Southern Asia which accounts for over 70 percent of the out of school population. In many parts of Sub-Saharan Africa and Latin America children do not attain minimum proficiency levels in math and reading. To underscore the point wealthier households tend to produce children with the highest levels of academic proficiency. There are also significant disparities between developing and developed nations when it comes to pre-primary and primary education. One of the hurdles to ameliorating the situation involves the scarcity of well-trained teachers and the condition of schools in some developing regions. In Sub-Saharan countries, this situation is compounded by schools that have less access to the Internet and even basic necessities like electricity and potable water. While more funding is required there has been a $200 million decrease in funding between 2014 and 2015.